moments of clarity: one giraffe, two giraffe, three giraffe, FOUR! one giraffe, two giraffe, three giraffe, FOUR! can you believe it? FINALLY! its not gracie but a giraffe!!! well...im experimenting with different styles...not sure if im happy with any of them but theres aspects in each giraffe that i do like. maybe i can combine them all to make one SUPER GIRAFFE! hmm...they kind of look like theyre all in a line up for committing some sort of crime...some horrible crime of cuteness i think. Big smiles for your new posts- you have the best color sense of anyone I know, as well as great shape sense. 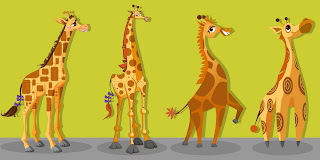 They are all giraffes, but all different! Someone who can do variations is valuable indeed. too cute. that is all. present for you so go to my blog!